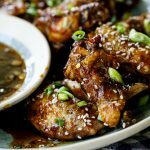 Crispy oven baked chicken wings coated in a sweet, spicy Asian glaze is a delicious appetizer and perfect for Superbowl snacking. Crispy. Sticky. Spicy. Chicken wings. These are all some of my favourite words. 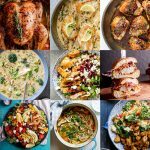 And they’re all together in one recipe! Hurray!! These Asian crispy baked chicken wings are just so delicious and I might or might not be able to eat the entire batch. And listen, you’re not allowed to judge because these wings are just absolutely addictive. 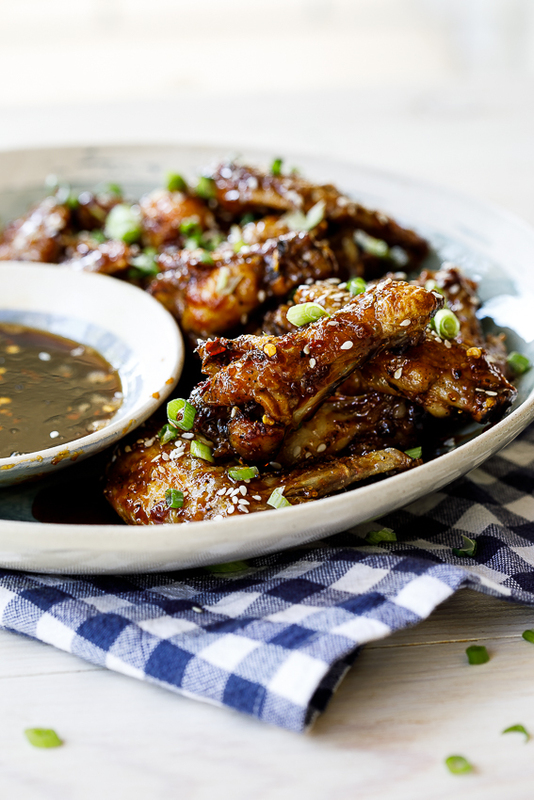 Making crispy, crunchy baked chicken wings is so easy and much less fussy than frying them. And then obviously they’re healthier but we’re about to cover them in a sticky Asian glaze so let’s not go on about how healthy these are, shall we? The crispiness though is what I love so much about these. 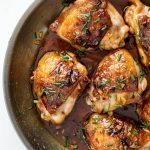 They have this roast chicken flavour and then you cover them in that sticky glaze and you have a little flavour bomb just waiting to be devoured. 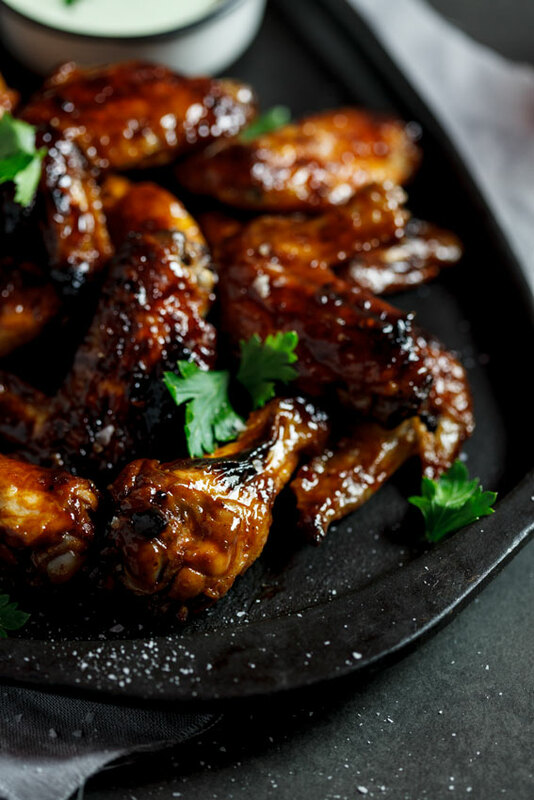 These baked chicken wings are PERFECT for Superbowl snacking but honestly, they’re pretty great any day of the week. 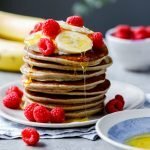 Make them, you won’t be disappointed! At 200ºC/390ºF, they should be fully cooked after 30-35 minutes. Pat the chicken wings dry with kitchen paper then coat in a thin layer of oil and season well. 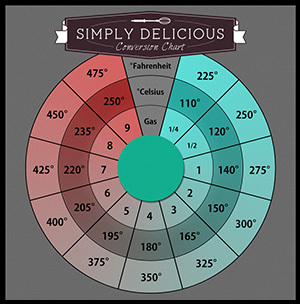 Place onto a wire rack set over a baking sheet in a single layer. Bake for 20 minutes until crisp and golden then flip and bake for another 10-15 minutes until the wings are crisp and golden all around. Pre-heat the oven to 200ºC/390ºF and place a wire rack over a baking sheet. Pat the chicken wings dry then place in a bowl and drizzle over the oil and season with salt and pepper. Mix well and place on the wire rack. Place in the oven and allow to bake for 25-35 minutes (flipping after 20 minutes) or until golden brown, crispy and cooked through. To make the Asian glaze, combine all the ingredients in a saucepan and bring to a simmer. 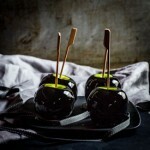 Allow to cook for 10 minutes or until reduced and syrupy. 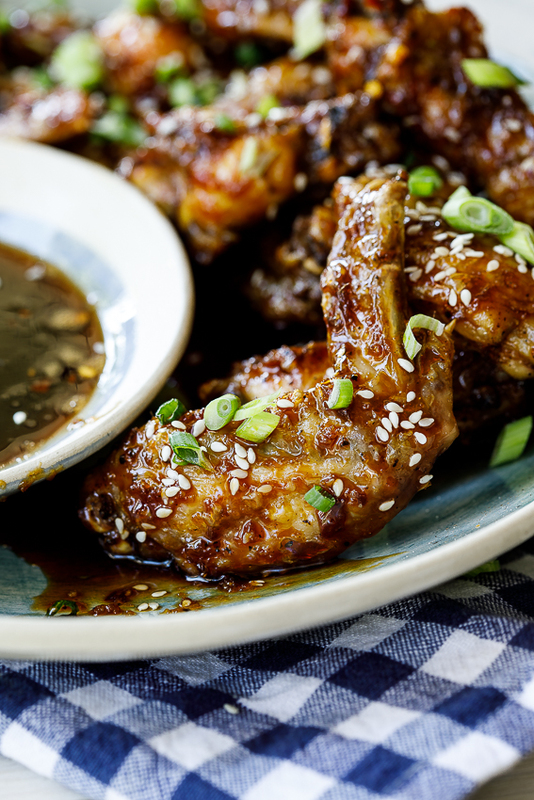 When the chicken wings are cooked, Place them in a clean bowl and pour over 3/4 of the Asian glaze and toss to coat. 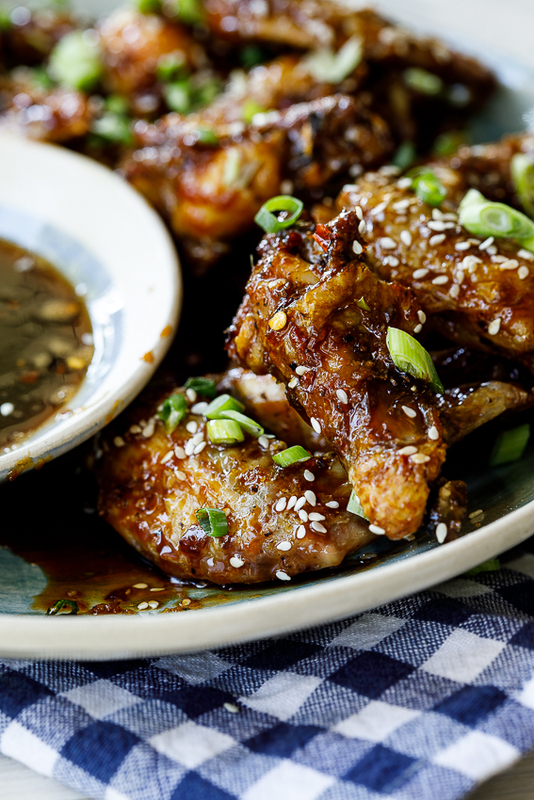 Serve the chicken wings topped with spring/green onion and sesame seeds and the remaining glaze for dipping. 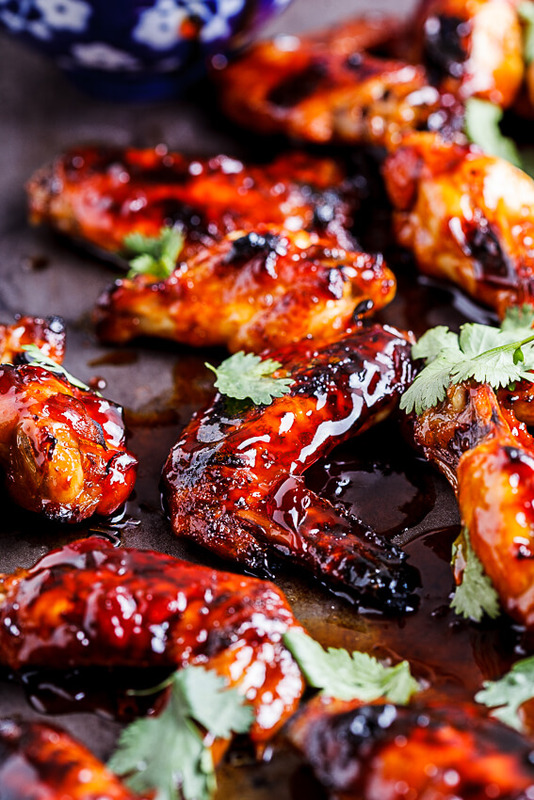 Perfect wing recipe. Easy and delicious. I’m hosting a Super Bowl party this Sunday and decided to make your wings. I made the glaze ahead and will keep in the fridge until I’m ready to glaze the wings on Sunday but I just had to tell you how totally delicious it is. I couldn’t stop tasting it once it was done. I can’t wait to see what it’s like on the wings. Oh, I’m so glad to hear that Tina. The glaze is super delicious. I hope you have an awesome Super bowl party! 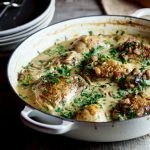 We made this recipe last night and my husband and I loved it. Definitely too spicy for the kids but I just took out a little of the glaze and baked theirs separately. Great recipe. I’m so glad to hear that Amanda. I thought they would be too spicy for my kids but they actually loved them. Clever to just bake theirs separately though! This is wings perfection. They look so sticky. Love. It wouldn’t be a Super Bowl party without wings Alida! Love the flavor of these!